This is the squadron patch for the 9th Fighter Squadron which is one of the operational squadrons for the F-117 Stealth Fighter out of Holloman AFB, NM. This is the red version of the squadron patch for the 9th Fighter Squadron which is one of the operational squadrons for the F-117 Stealth Fighter out of Holloman AFB, NM. 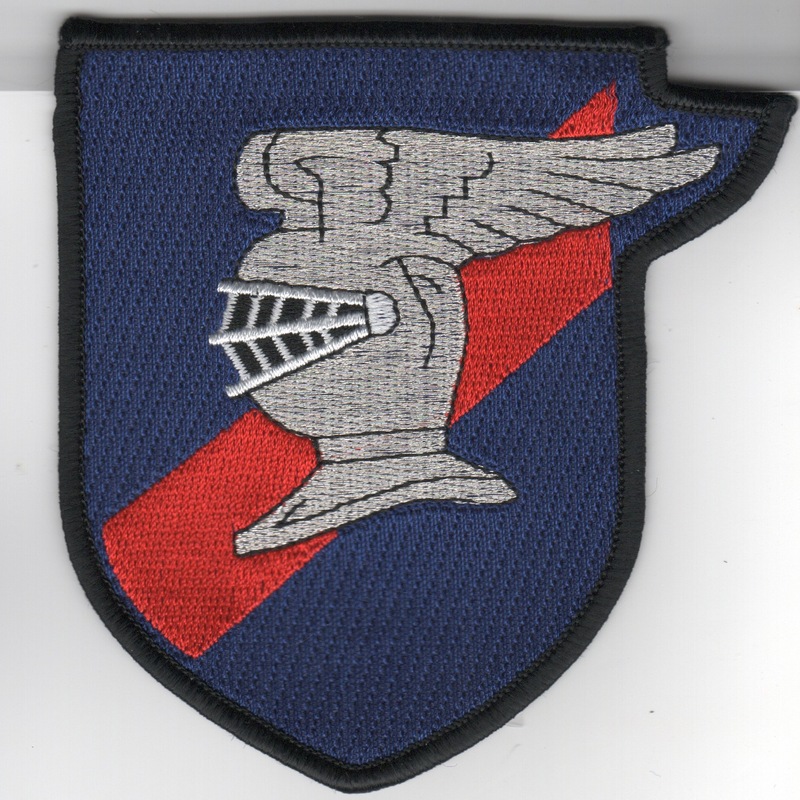 This is the desert version of the squadron patch for the 9th Fighter Squadron which is one of the operational squadrons for the F-117 Stealth Fighter out of Holloman AFB, NM. This is the 'Friday' patch for the 9th Fighter Squadron which is one of the operational squadrons for the F-117 Stealth Fighter out of Holloman AFB, NM. It shows the silver knight on a field of red/blue shield. This patch does not come with velcro attached. 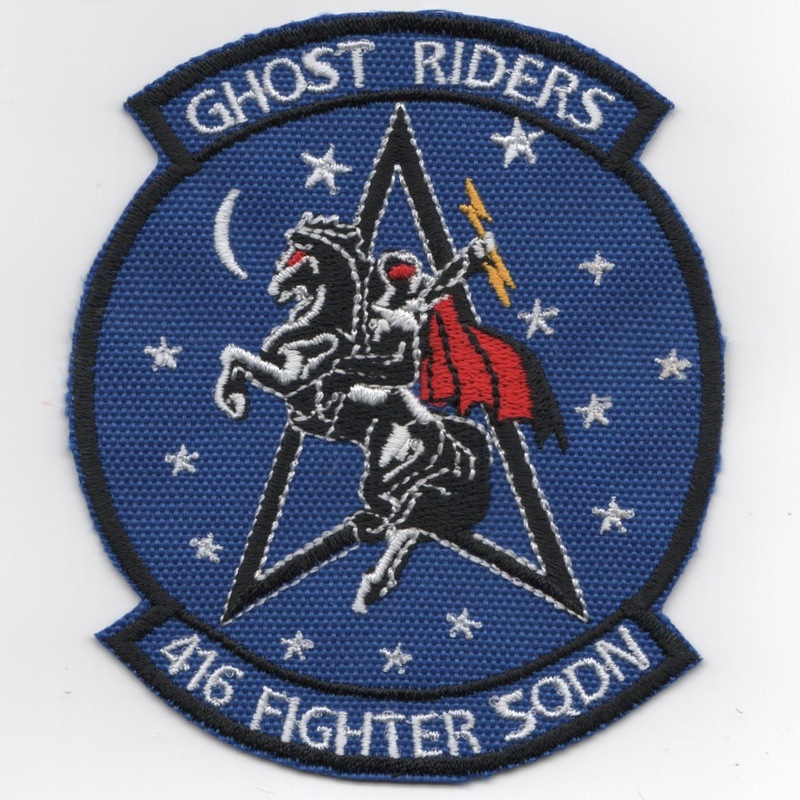 The 416th Fighter Squadron is an inactive USAF unit. Its last assignment was with the 49th Fighter Wing at Holloman AFB, NM, but was inactivated on 1 July 1993. This patch was found in a Korean embroidery shop in VERY limited quantities and does not come with velcro attached. This is the Weapons Instructor Course (WIC) shield for the F-117 Nighthawks. This is the Stealth Fighter's "pride" patch, stating they are "The Boss" and where they come from... "Born in the USA". This patch is for the F-117's mission during the latest conflict...It says "Hot & High - Fast & Low" along the top, and "Terrorist Terminator" along the bottom. This patch is the "yellow starburst" version of the "Team Stealth", created for the F-117's designers, the true "Team Stealth". This patch is the "purple" version of the "Team Stealth", created for the F-117's designers, the true "Team Stealth". It says "When It Absolutely, Positively Has to be Taken Out Overnight" along the border. Picked up in Korea: This is the F-117A 'NIGHTHAWK' 25th Anniversary coin which depicts several of the unit logos along the bottom front with a "Nighthawk" landing on the jet. The back of the coin can be seen below. Picked up in Korea: This is the F-117A 'NIGHTHAWK' 25th Anniversary coin which says "25 YEARS" and "250000" HOURS on the back, with the words "STEALTH FIGHTER" along the bottom. The front of the coin can be seen above. Homepage | Order F-117 Patches!